Coralline algae is a red algae and the pink or purple form is more common in saltwater aquariums. In the ocean coralline algae is found on nearly every reef and in the wild several unique forms exist such as types that grow in a scroll pattern, a branching pattern and a lobed pattern. 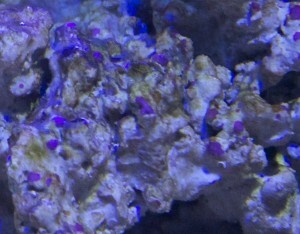 In saltwater aquariums nearly all coralline algae is of the encrusting type. Coralline algae uptakes calcium during growth and for this reason you may need to increase calcium doses if you have an abundance of coralline algae in your tank. Magnesium is also though to boost it’s growth. Products that claim to encourage coralline algae growth are usually nothing more than concentrated doses calcium and magnesium so simply raising your tank’s calcium and magnesium levels will likely get you the same result assuming there is some amount of coralline algae in your tank. If you don’t see any coralline algae in your tank, acquiring scrapings or a frag with some coralline algae on the plug will introduce the algae into your system. I was once asked to overnight coralline algae scrapings to Hong Kong so if you are looking to start a side business, coralline algae scrapings may be your calling! As I wrote in yesterday’s Terrible Advice Tuesday’s post, the abundance or lack of coralline algae is not an indicator of your tank’s health. If you don’t see it in your tank, there are plenty of hobbyists who would love to have your problem as they hate coralline algae. Finally, worrying that coralline algae will render your live rock useless due to the clogging of pores is a waste of your time. There will be plenty of areas on your rock where coralline algae won’t grow. I’m of the old addage coraline alge can grown anywhere except to front glass. My urchins would be a little miffed if there was none in my tanks. I had a great covering of pink Coralline algae on my back glass and overflow box. I dosed Seachem’s Kanaplex medication into my tank to treat a fish. The next morning, my Corraline had pretty much lost all its pink and turned a green/grey colour! Has it all died off? I dosed according to the instructions (a bit less if nothing else) and there was no mention on the container of coralline algae dying off as a side effect? How can I repair the damage so to speak? I have found that the coralline algae will eventually clog power heads, clear tubing and such. Once a year I soak them all in vinegar overnight. By the morning the algae is easy brushed off and the device cleaned. I have what appears to be green coraline algae. Mostly on the glass. Is this coraline or some other type of algae? I do have some of the pink type on the rocks. Seams that like rust appearing when you least want it, coralline algae will clog pumps and coat equipment making life tough, but when you really want to grow it, especially of a certain color it won’t grow. My first reef tank was a 55gal tank and as a beginner I didn’t even notice it till someone asked if I’d painted the rock, and the next tank I played with over 12years now since I got it, a 180 gal 6x6x2 won’t grow it in any color but white occasionally but over all it won’t stay in any form, even though the tank is overall successful, with good water parameters . All manner of potions and scrapings won’t get it started. A strange type of coralline structure has grown in some area’s of a pink and orange color , these seem like a colored crystal or a calcite bunch of pointy grapes with a thin strand on the ends of each growth, and are very hard. Anyone got an idea what these crystalline growths are that grow in clusters ? Hey mr. saltwater tank. my question is ,doesn’t coralline algae grow naturally at some point without introducing into the tank. in other words i have reef saver dry rock 100% in my tank. will coralline algae naturally come without me physically introducing it??? John G…coraline will come in on frags and/or water from livestock bags.